If you’re involved in a road traffic accident which is not your fault, you may be entitled to make a personal injury claim. Within this, you can make claims for the initial injuries that you are suffering, financial losses and compensation for damage to your vehicle. You may also need to make a claim on your own vehicle insurance for initial repairs to your vehicle, before receiving any compensation due from the other party involved. If you do this, your insurance company may charge you the excess which is outlined in your insurance policy. 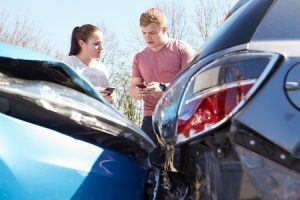 In this guide, we will take you through what you need to know about making car accident claims and how your insurance excess works. If you have been in a car accident which was not your fault and have been injured, you may be able to claim compensation for injuries sustained as well as damage to your vehicle and other, out of pocket expenses. There are two types of compensation which you can claim from the other party following a road traffic accident which was not your fault. The first is special damages, the second are general damages. Special damages: these types of car accident claims cover any financial losses that you may have incurred. They ensure that you are not out of pocket after the accident, and allow you to claim for future expenses. Within this, you can include car accident claim excess charges which come from your insurance company. These damages also cover travel expenses, medical costs (including prescriptions) and the cost of rehabilitation, home and vehicle adaption as well as assistance around the home. General damages: General damages are paid out based on the injury and its severity. General damages are also calculated on the basis of how much pain and suffering your injury has caused. Estimates from a medical expert on your injury and your prognosis, as well as lasting effects, will contribute towards these calculations. How Do Insurance Excess Fees Work? We will use the example insurance excess amount of £100. If you have an accident where the cost of the repair is £1,100, your insurance provider will ask you to pay for the first £100 of the repair. The remainder (£1,000) will be paid by the insurance provider. The insurance provider could ask you to pay the first £100 or withhold this from any payments to a third party. All insurance policies will include a compulsory excess, some will also include the further, voluntary excess. If You Have An Accident Which Is Not Your Fault, Do You Still Pay An Excess? Insurance excess is the amount of money which is either held back by an insurance company or which you have to pay in the event of making a claim. Even in the event of a car accident, not my fault, you will still need to pay this amount. The cash figure for this will vary according to your vehicle, policy, cover, the number of years driving and whether or not you have protected your no claims bonus. Some policies also allow you to add a further car accident voluntary excess, reducing the cost of your insurance. You will pay the excess in the event of any claim you need to make against your insurance policy. This is regardless of whether or not you were to blame for the accident. If it is proven that the other party was responsible for the accident and that you were not at fault, you can recover the cost of this ‘excess’ payment from their insurance policy. This can be done on its own, or as part of a car accident claim. You can claim the non-fault car accident excess back from the other party. This will often be done by your insurance company working with the third parties insurance provider. If you have difficulty recovering this, you can go to court to claim this back from the other party’s insurance provider. A conditional fee agreement or no win no fee services is provided on the basis that if your claim is unsuccessful, then you will not have to pay anything for your solicitor’s services. No win no fee agreements are helpful for those who are worried about affording upfront costs. A no win no fee agreement ensures that there are no nasty surprises for claimants. At Legal Expert can help you recover the compensation you deserve, as well as any excess fees which you might have had to pay. We are able to work with you, providing all the help and advice which you need. Talk to us today by calling 0800 073 8804. You can also send us an email or contact us using our online chat feature. Find out how much you can claim for an accident as a passenger in a vehicle. Guidelines and information about insurance policy excess charges.